Community, Commerce and Connectivity – three words looming large as the city of Southlake has rapidly grown into an energetic suburb of close to 28,000. Exemplary schools and sprawling estates have drawn many a family to call the city home while world-class shopping and entertainment continues to expand the roles of those who visit. Area developers and city officials alike continue to help bring new and improving projects to what is considered one of the most vibrant markets in the country. An economic slow down brought many developments across the United States to a standstill. However, with phase one completed and phase two expected to start this month the earth is once again moving, literally and briskly at Carillon in Southlake. The first phases of the master-planned Hines development with its newly paved streets are taking shape beyond pastures of grazing cattle at the corner of White’s Chapel and 114. Kirkwood Boulevard and other new streets within the community lead to the very first of 404 homes set to make up Southlake’s latest upscale development. What started in the Fall of 2007 with the Hines purchase of a large swath of land encompassing parts of Dove Creek north of 114 has turned into a 285-acre master plan for mixed-use development. With a plan more than twice the size of Southlake Town Square’s 130 acres, Carillon aims to stay true to the before mentioned words through a selection of luxury homes, corporate offices, retail and entertainment venues carefully organized amongst a backdrop of scenic open spaces that will no doubt add to the award-winning landscape of our city. Since the purchase of the land in 2007 the responsibility for the approval of the development’s plan rested with Hines Director Jeff Kennemer. “The original zoning of the property was predominately commercial,” explains Kennemer who spearheaded early efforts to get the area re-zoned allowing for both residential and commercial uses. During a lengthy two-year process Kennemer and Hines worked closely with city officials to complete a master plan that met the city’s needs and a level of quality that was on par with Southlake’s storied and celebrated development. In addition to the city’s needs, all developers entering the city would have to be conscious of how their projects would impact enrollment at the Carroll ISD. Care would need to be taken to ensure the future number of residences would not put a strain on any CISD campus’ resources. And as with any development in Southlake, the end product would need to be of the highest architectural quality. Reminiscent of the French Renaissance, Carillon was designed to include detailed masonry, arched windows, accented doors and stoops and other decorative elements from this highly cultured and classic era in history. With the plan officially approved at the end of 2008 it was time for shovels to hit the ground but the worsening economy caused for a serious hiatus. That was until Children’s Medical Center entered the picture. In April of 2010 Children’s Medical had announced its plans to build in Southlake and more specifically Carillon would be the home of their latest Pediatric Specialty Care Center. Trent Smith Senior Vice President of Network Development for Children’s Medical Center explained, “Southlake is a beautiful community with a wonderful reputation and we wanted to be located in such a community where we could take an active role in improving children's health and participating extensively in a wide array of community activities." Amongst a plethora of potential sites Smith and Children’s Medical saw vast potential in Carillon. Smith adds, "The Hines' Carillon development offered the best combination of site amenities of any of the sites we investigated. It is a convenient, high-visibility location along Route 114 and was already planned and approved by the city. Hines is a highly regarded developer and we liked everything we saw in their plans and illustrations for the approved community. They expressed strong interest and flexibility in accommodating our site needs and demonstrated a strong desire to have Children's Medical Center of Dallas be the first project in the beautiful Carillon development." And with final approvals to build their $21 million facility in hand Children’s Medical targeted a grand opening date of June 2011. With the timely completion of Kirkwood Boulevard and the successful grand opening of Children’s Medical Center in June of 2011 Kennemer and Hines felt they had the necessary momentum to officially start the first of six phases of development, which included the plotting of 94 residential lots, which are now available for sale, nearly –a quarter of the homes that will eventually be made available. At the writing of this article, phase two which will include the construction of the community’s pool and amenity center is set to break ground with a completion date in March of 2013. Future phases will address the commercial areas and the remaining residential lots. According to Kennemer the completion date of the entire Carillon development is hard to narrow down but currently it is estimated for completion in the 2016-2017 timeframe. Bringing together community and commerce through connectivity Carillon will integrate three distinct areas through well-planned streets, sidewalks, and hiking and bike trails. The walkability and seamless consistency is the architectural thread throughout the entire development and creates a space that successfully balances all aspects of suburban life. At Carillon 68 acres of parks and greenways, almost one quarter of the entire development, help create a peaceful and natural setting. The development’s lakeside lots will be beautiful but according to Kennemer they are highly functional as well. “We went above and beyond the city’s needs for water detention in the area,” he explained that Carillon’s lakes help to provide as much as three times the necessary amount of storm water retention in and around Dove Creek. 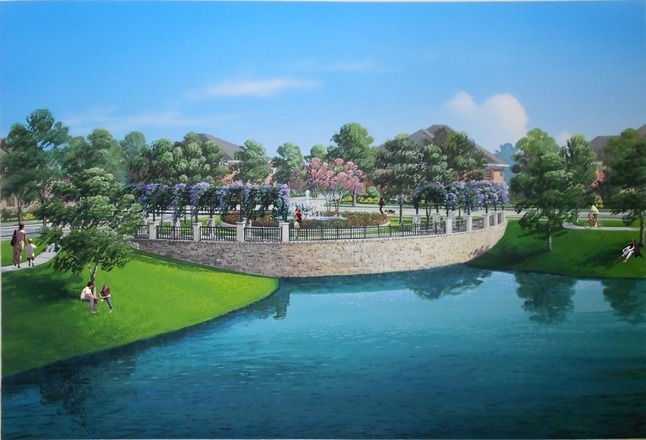 Chateaux home sites will not be the only things overlooking the 12-acre Lake Carillon. Gardens, benches, pavilions, and public pieces of art are all planned to compliment the lake and its surrounding area creating plenty of opportunities for community and recreation. Working from west to east, at the core of the commercial development is the Plaza and Corporate District that will include 400,000 square feet of retail and an additional 300,000 square feet of office space. Within the allotted office space are plans for three office buildings designated at 100,000 square feet each. “We would love to get a corporate relocation to come to Southlake,” says Kennemer who explains Carillon could even work with one tenant in the creation of a multi-unit campus in the heart of it all. If that were to happen, future employees could live, work and play all within a short walk of each other. Close to the offices and retail would also be a hotel. 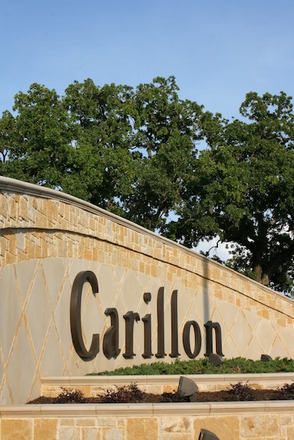 In similar fashion to the Southlake Hilton, Carillon’s future hotel would maintain 150 to 200 rooms in a full-service environment. The developers are currently looking for an upscale brand with the right pricing mix. Immediately south and west of Kirkwood Boulevard the French inspired theme will cascade into the residential area known as the Village District. “We want residents and visitors to feel as if they are in a French village,” says Kennemer. Comprised of three unique maintenance free, “lifestyle lots” suitable to couples and smaller families these detached single family residences will be within close proximity to a multitude of open spaces, shopping and dining and the future amenity center and pool. Starting at $550,000 each of the predominately two story villas will be a minimum of 2,800 square feet and include private courtyards. The district’s first custom home, built by Atwood Custom Homes, is nearing completion. Located at 1805 St. Philip, this French-inspired villa has four bedrooms, four bathrooms in a grand total of 3,688 square feet. Selling immediately at a price of $699,000 it and others like it will be the perfect home for people looking for the convenience of smaller lot living that still allows for an optional water feature or play pool. True to a carefree lifestyle, the Carillon HOA fees include front yard maintenance. Further east and to the north and east of Kirkwood Boulevard are the luxury home lots of the Chateaux District. Here the larger estate lots measure 90’ x 130’, 100’ x 155’ and 120’ x 160’ and will take full advantage of sweeping views of the development’s two lakes. In this area the architectural design is “wide open” and homeowners can choose most any style from French to Mediterranean and most anything in between. Kennemer says, “we want a broad range of beautiful homes in the Chateaux District,” and in addition to Atwood Custom Homes the developers have already chosen several local custom builders including Patrick Duffy Custom Homes, Cambridge Homes and Diamond R Custom Homes. At 285 acres Carillon represents the largest commercial and residential development to date in Southlake. Early estimates for incremental tax revenue to the city and schools (at full build-out) could add as much as $3 million annually for the commercial development and as much as $6.5 million from the residential side. Even though there is still much to be done to successfully reach a targeted completion in 2016, Carillon has already begun to make a positive impact on the city.